David Yanez talks you a simple tutorial for clothing a rig. Click the image to check it out! Recent Animation Mentor graduate Tony Chau presents some indepth posts on his personal blog, Life in Animation. The first, titled The Way of the Student, presents an honest look into the his from school, that may help with your own animation studies. It includes a secret revelation. 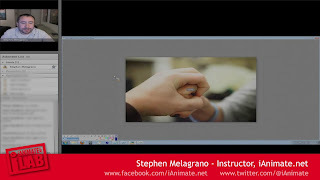 No animation school, including Animation Mentor, can present you with all the answers!! Learning animation is hard for each and everyone of us. It is also very competitive. In order to provide his/herself with best chance to succeed, the student has the responsibility to not only soak up the advice provided from the teachers, but realise most education is self education. Much of the effort needs to come from you! Tony has recently posted his own thoughts on the handling of weight. Check it out!! 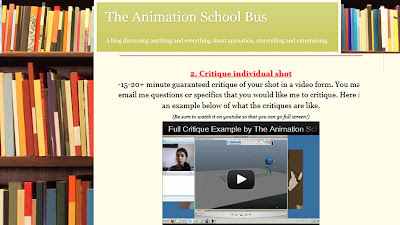 Kelly Perez presents some reassuring advice on the Animation School Bus blog. Also includes some helpful tips regarding how to solve those pesky knee pops. Click the image to check it out! This month's challenge is inspired by one of my favourite scenes from the film, Chitty Chitty Bang Bang. Hapless inventor Caractacus Potts is running for his dear life, when he finds himself amongst a group of merry dancers! If you haven't seen the film, I won't say no more except watch it!! 'A gentleman's got a walking stick. A seaman's got a gaff. They hide their ruddy swords. The challenge is to show a character interacting with a bamboo stick. He could be fishing, dancing, fighting, the choices are up to you. 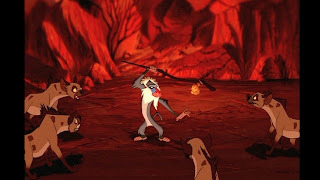 As inspiration, I wish to show you a scene of Rafiki from Lion King fighting. Yes, I know he is not using a stick made from bamboo, but hopefully it'll give you a few ideas. It'd be nice to see a variety of ideas, so we not limit the size of the stick. You may wish to research different cultures to see what bamboo can be used for. Please note, in tribute to those who are taking part in the Mc 33: Track and Field, no Olympic style pole vaults are allowed. Just use your imagination and see what you come up with. As always the animation could be anywhere between 75-125 frames. If you have any questions about submission requirements, please check How-to-participate section for more details. The deadline will be Monday 1st September 2012. Good luck and happy animating! Here is a few links for you showing how actors think about their scenes. 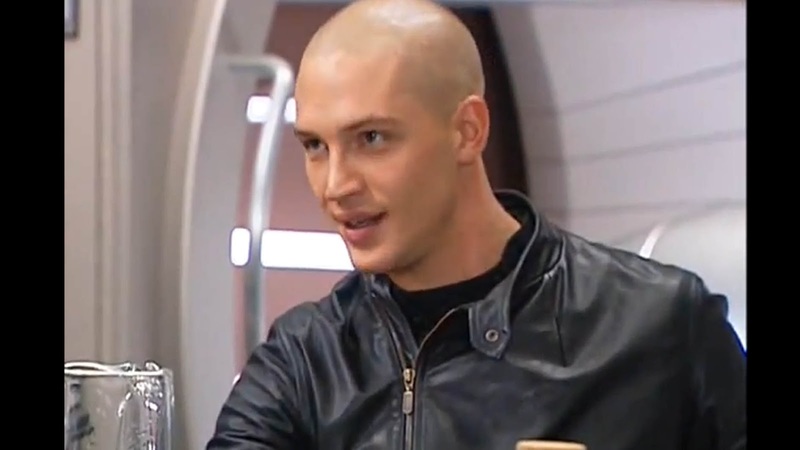 We start with this post from Onanimation, showing how Tom Hardy and Patrick Stewart prepare for a scene. Watch how Tom Hardy experiments with different nods and eye movements, which are really stripped down in the final shot. Check it out here! Next up, we have 10 Lessons in Film Acting from Michael Caine, posted together in one place by nofilmschool.com. Lastly, I wish to leave you with a clip posted on the forums by Robert Holmen (robcat2075). It presents the youtube series, Real Actors Read Yelp, which shares similarities with how 11 SC community members interpret an audio clip in their own unique way. Enjoy! Stephen Melagrano talks you through how negative spacing can help determine the strength of a grip and weight of an object. Click the image to check it out! Blog Round-up: Kevan Shorey "What I Wish I Knew"
Kevan Shorey has a wonderful post over at Rhymes With Red Van about getting used to being in the animation industry. Although he is talking about working in a major studio the concept translate to those of us who are still trying to get there. To often we glance at demo reels and the winning submissions on The 11Second Club and we think "I could never do that!" In this post he points out 5 points that are all to important. 1) Everyone is better then you, and that's OK.
2) You will catch up eventually. Perhaps one can't get the kind of subtle eyelid movement in stop motion as one can get in computer animation, but the illusion of life is just as possible. 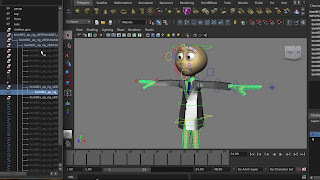 This tutorial gets into principles of life-like facial animation that will bring a stop motion or clay animation character to life. I'm using clay faces for demonstration, but the techniques would apply to an articulate stop motion face, and the principles would apply to CG and hand-drawn animation as well.